Unitex Render Warehouse, better known as URW®, is the Trade Outlet store for Unitex®. URW® stocks all of the Unitex® range of superior Renders, Textures & Finishes, Architectural Mouldings & Columns, fully accredited lightweight wall cladding systems, and all the tools required to do the job right, first time. Our friendly in-store staff and Technical Sales Representatives are there for all your Unitex® requirements and onsite advice. 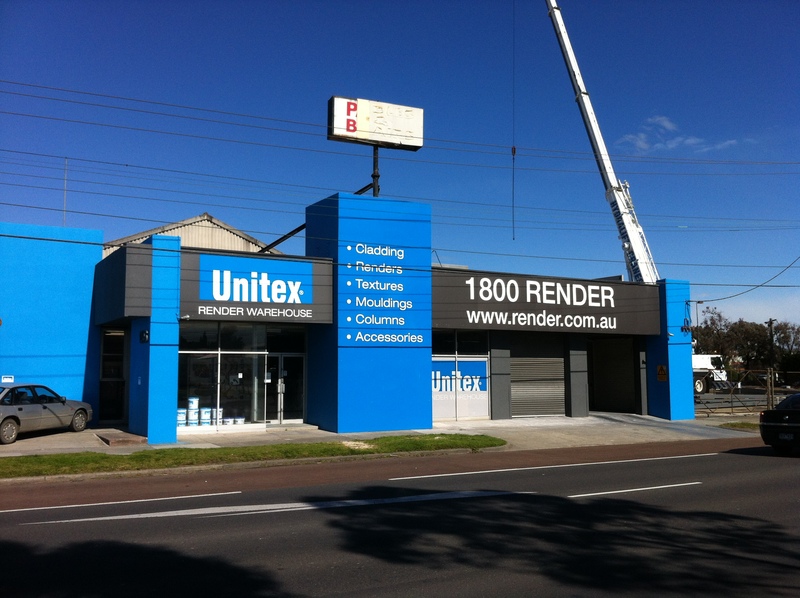 Unitex® – manufacturers of cladding, renders, textures, mouldings and columns. Unitex® started trading in 1983 and was founded when two expert, solid plasterers joined forces with an experienced, industrial polymer chemist. The latter also brought development and manufacturing experience, both in Australia and overseas, to the partnership. So from the beginning we have had a strong technology base, yet at the same time, a very practical focus. The resultant union of practical skills and technological knowledge has given rise to Australia’s most innovative manufacturer of specialty exterior wall materials. This range of products includes external wall polystyrene cladding, specialty renders, applied texture finishes, masonry paints, mouldings and columns. The Unitex® brand is built on a platform of ‘innovation’ and ‘service’. It’s a name that Specifiers, Builders, Applicators, Developers, and Home-owners alike have grown to know and trust. Unitex® introduced Australia to, and are market leaders in, External Insulation Finishing Systems (EIFS) as we have combined experience of more than fifty years in the manufacture and application. Our wall coatings are of the highest quality and available in a large range to complete your project. We use high-quality raw materials to ensure our customers are delivered a consistent, high-quality product. Our company’s programme of continuous raw material evaluation ensures that we use the most cost-effective, proven and best ingredients to provide our customers with fair-priced end products. Where possible, and without ever compromising the high quality of product our customers expect and deserve, we incorporate recycled raw materials. This helps us do our part for the environment. Our Research and Development team are continuously challenging convention. Developing smarter ways of working and innovative new products with increased customer benefits as the defining focus. Supporting this continuous improvement programme is our dedication to service. We take great pride in successful customer-driven service systems. Through innovation and service we will deliver a superior level of customer satisfaction by meeting the needs of customers – promptly and effectively. This customer-driven philosophy will apply to all interactions with our customers – before, during, and after the sale. As we supply superior service and satisfaction our customer base will continue to grow. This expansion will, in turn, provide us with increased resources to continue our Research and Development into further innovation. Our products will be developed for our customers and with the environment in mind – from manufacture, to minimising waste during construction, to their effects on people’s living environments once installed. We aim to continually provide innovative, sustainable and cost-effective answers to our customers’ needs, year-after-year.